A lady in a faded gingham dress and her husband,dressed in a homespun Threadbare suit,stepped off the train in Boston,and walked timidly without an appointment into the Harvard University President's outer office. The secretary could tell in a moment that such backwoods country hicks, had no business at Harvard and probably didn't even deserve to be in Cambridge. For hours the secretary ignored them, hoping that the couple would finally become discouraged and go away. They didn't,and the secretary grew frustrated and finally decided to disturb the president, even though it was a chore she always regretted. He sighed in exasperation and nodded. The president, stern faced and with dignity, strutted towards the couple. The president wasn't touched. He was shocked. "Madam," he said, gruffly,"We can't put up a statue for every person who attended Harvard and died. If we did, this place would look like a cemetery." The lady turned to her husband and said quietly,"Is that all it costs to start a university? Why don't we just start our own?" 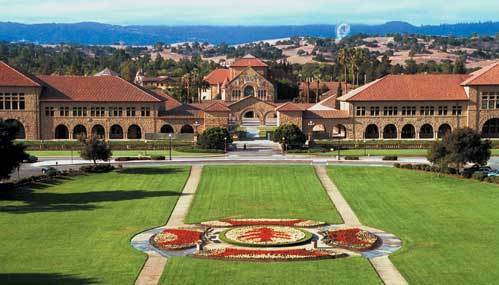 Mr and Mrs Leland Stanford got up and walked away, travelling to Palo Alto, California where they established the university that bears their name, Stanford University, a memorial to a son that Harvard no longer cared about.